Welcome to Northwestern and Chicago! 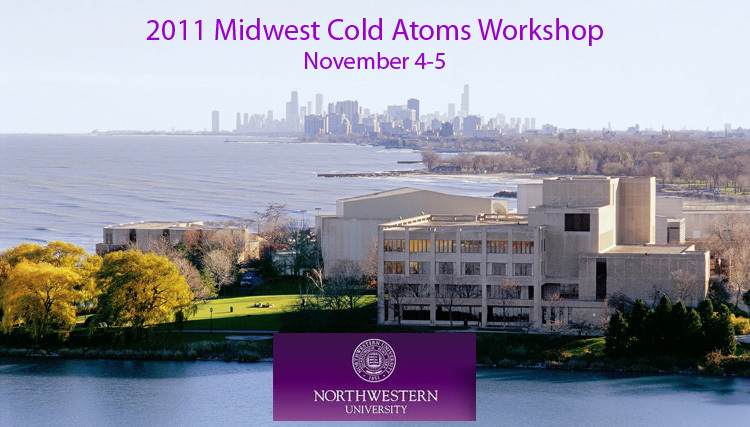 The 2011 Midwest Cold Atoms Workshop (MCAW 2011) will be held at Northwestern University in Evanston, IL, from November 4-5, 2011. MCAWs are grad-student-friendly and inexpensive for attendees in the Midwest region. The workshop begins with a Friday night poster session, with talks given throughout the day Saturday. Prior to the official beginning, participants are invited to the Friday afternoon Northwestern colloquium (Tanya Zelevinsky, Columbia University ultracold atoms research) and to an unofficial workshop dinner in downtown Evanston.